The federal government on Wednesday suspended the sack of members of the National Association of Resident Doctors (NARD) pending the conclusion of the ongoing negotiations on the matter. This was part of the resolutions reached at the mediatory meeting initiated by the Speaker of the House of Representatives, Rt. Hon. Yakubu Dogara, between the federal government’s delegation and leaders of NARD. The Minister of Health, Prof. Isaac Adewole, was quoted to have suspended the sack as part of the decision taken at the mediatory meeting with NARD. 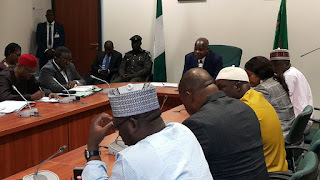 At the meeting, it was reported that the “Ministry of Health was to come up with list of those entitle to skipping and the amount and when they will pay them in one week. Forty two (42) institutions that have not been implementing skipping should be asked to commence implementation immediately. “Committee of CMDs to meet in one week and implement skipping by June and any CMD that is unable to pay should appear at the next meeting on July 14. The judgment of the Industrial Court must be executed.